It refers to an object or objects close to both the speaker and the hearer. 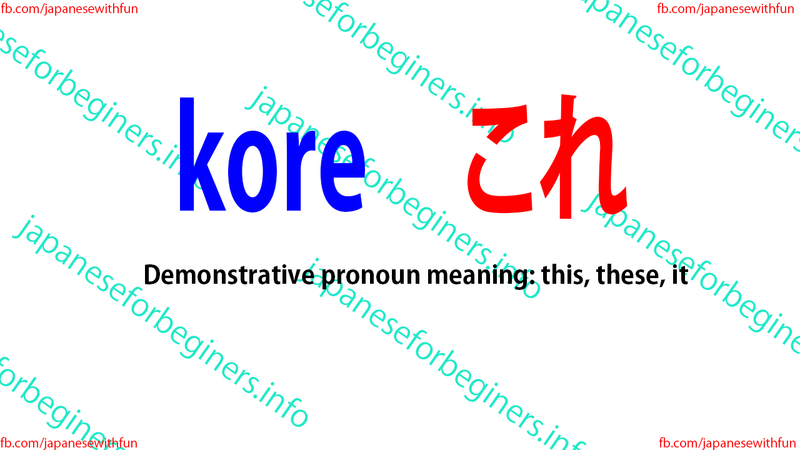 The polite form is kochira, which also means ''this person'' or ''this direction''. 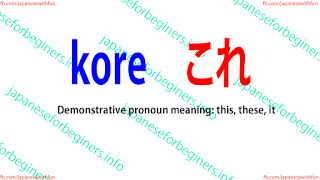 kore becomes kono before nouns it modifies. Moreover, it becomes koko when expressing ''this place'' or ''here''. Kore ga kinou katta kamera desu. This is the camera that I bought yesterday. Kore o mita koto ga arimasu ka. I'll work hard from now on. Kochira ga yamamoto san desu. Koko ga watashi no ie desu. Koube yuki no purattahoumu wa koko desu ka. Is this the platform for the train to Kobe?